Content marketing is changing the face of marketing departments and public relations (PR) agencies. In case you haven’t heard of it yet, content marketing is the process of generating high-quality online content with the goal of building trust among your brand’s target audience, and to establish your brand as an industry thought leader. To run a successful content marketing campaign you need great content, and you need that quality content to show up in all the right places online. The latter, is where the PR professional comes into play. You need an individual who has outreach expertise and knows how to make sure your content appears across important social media networks and earns high-quality mentions and links from influential blogs and online publications. Traditional PR roles are changing quickly, and the days of pure media coverage are moving more towards link building campaigns, search engine optimization (SEO), and online social engagement. In the past, PR professionals relied on writing a press release, pitching big media outlets, and crossing their fingers their content gets published. However, with the growing prominence of online content, earning quality “likes,” shares, tweets, and blog posts can sometimes be a better way to speak to your target audience. As more businesses start transforming their traditional marketing departments into content marketing departments, they will have a higher demand for PR professionals who have skills that extend beyond planning an event or writing press releases for big media outlets. These businesses will need professionals who can effectively use Google Analytics, SEO, email outreach and social media to reach target audiences. 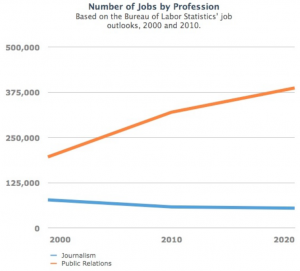 According to the Bureau of Labor Statistics (BLS), between 2000 and 2010 the number of PR specialist and manager jobs rose by nearly 63 percent, and is expected to rise another 21 percent between 2010 and 2020. 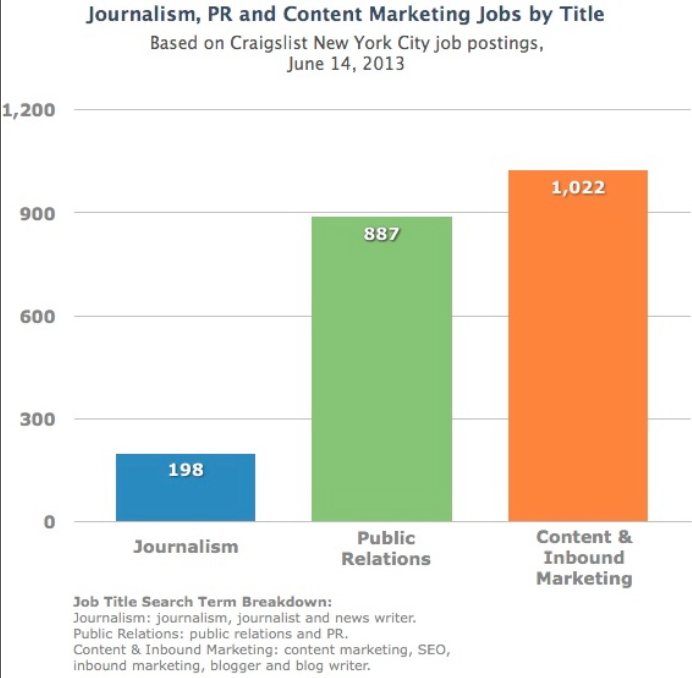 Holly Regan, Managing Editor at Software Advice, did a quick search on the New York City Craiglist’s page to get a better picture of the PR and content marketing job market. The graphic on the right shows what she found. In past years, PR college graduates almost always looked for jobs only at marketing agencies and traditional PR firms. However, with the rapid growth of content marketing the need for PR professionals is rising, and new marketing careers are popping up for those who have the necessary skills to reap the benefits of this trend. Here are a few suggestions for PR or entry-level marketing professionals who want to take advantage of the growth in content marketing. 1. Directly speak to your target audience. Remember that big media outlets are not the only way to reach your audience. Learn how to directly speak to your audience through online platforms like social media networks and blogs. 2. Expand your skill set. As a PR specialist you must learn more skills than how to draft a quick press release and reach out to big media outlets. You must learn new skills like: SEO, graphic design, and social media marketing. 3. Take advantage of storytelling. PR professionals are usually good storytellers. Use these skills to develop your own content strategies, such as online social profiles and blogs. 4. Be ready for rapid-response. Real-time platforms like Twitter and Facebook are forcing PR professionals to respond faster than ever. We recommend you generate “post-ready” materials before you start your outreach so you can quickly respond to your targets. 5. Don’t default to traditional PR outreach. The traditional PR model of sending out press releases and pitching big media outlets to generate high-quality media coverage may be coming to an end. Learn how to engage your audience using new tools like Twitter, Facebook, or blogs. Content marketing has changed the PR and marketing game, so make sure you have the required skills to reap the benefits of this trend. Is Quality Content an Endangered Species?